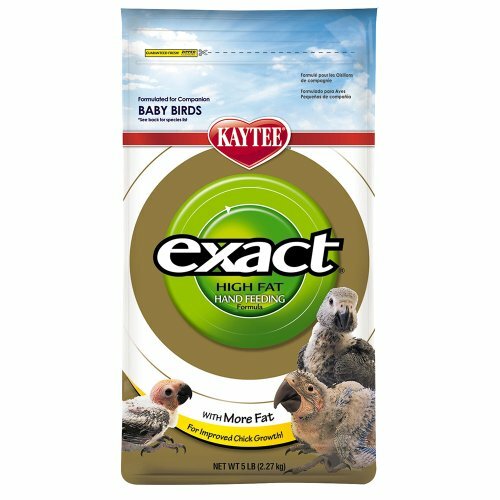 100504657 Size: 5 Pound Features: -Formulated for all baby birds. -Balanced, high-nutrient formula helps babies grow faster, wean earlier and develop better, brighter plumage. -Contains probiotics to encourage a healthy population of intestinal microorganisms. -With DHA, an omega-3 fatty acid for development of heart, brain and visual functions. Product Type: -Food. Animal Type: -Bird. Primary Color: -Whites & Tans. Primary Color: -Browns. Primary Color: -Greens. Generic Dimensions: -18 ounce Weight: 1.25 lbs. -5 lbs Weight: 5.1 lbs.